How a Magnetic Sweeper Can Help Your Business | IPES International, Inc. If you’re involved in a business such as commercial or residential roofing, it makes sense to have a magnetic sweeper. These handy tools gather materials, including the tiny little ferrous ones your eyes barely notice. Using a magnetic sweeper, you can clean up an area, picking up nails, shards and other magnetic materials in a quick and convenient manner. Obviously, you want to keep a work site organized and safe, right? You don’t want to leave any rogue nails on the ground that could puncture a tire and/or hurt someone’s bare feet. Sweepers are essentially powerful brooms. Magnetic sweepers are designed to be durable and hardy, rolling over rough surface areas that need to be cleaned up efficiently. Sweepers don’t take up too much storage room. Considering how they ultimately make work life easier and safer, many businesses make them a priority among their tool collections. After all, having a sweeper on hand is a smart way to collect what’s on the ground that shouldn’t be there, and a rolling sweeper collects these items in such a way that they can be held in the unit until the person in charge wants to release them in a certain place. Rather than walking around, bending down, and picking up small tools, brackets, nails and more, a magnetic sweeper saves your lower back from aches and pains. Just roll it over stuff and it works kind of like a vacuum cleaner does. The sweeper finds stuff you might otherwise miss, especially if there’s grass, dirt or debris below you, obscuring some things to the naked eye. IPES International of Pittsburgh proudly makes its magnetic sweepers here in the good ol’ USA. Indeed, IPES is an industry leader in magnetic sweepers. Whether you want to keep parking lots or work sites clean, know that IPES’ magnetic sweepers can do the job and do it well. 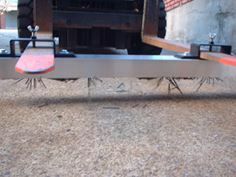 Definitely check out the TMRS series– these sweeper bars are among the most popular models IPES makes and sells. Want more information about IPES’ magnetic sweepers and how they can benefit your business? Please call 412-781-4660 today or email info@ipesmag.com.